Today, an announcement was released on the planned deal with Voyager. I wanted to share directly with the community about Ethos and our relationship to Voyager, the exciting road ahead, while also discussing the actual details of the article. We want to address everyone’s questions and what this means for Ethos, the Token and the Community. Let’s rewind back to the start of Ethos. Ethos was born out of the desire to build a financial ecosystem that was open, safe and fair for everyone to bring the ideas and philosophies of crypto to the masses and challenge the status quo. We want to do this idea justice to the best of our ability. Voyager shares much of that philosophy with us. We both saw the opportunity to build a better service and a brighter future together by leveraging the best that both organizations had to offer. 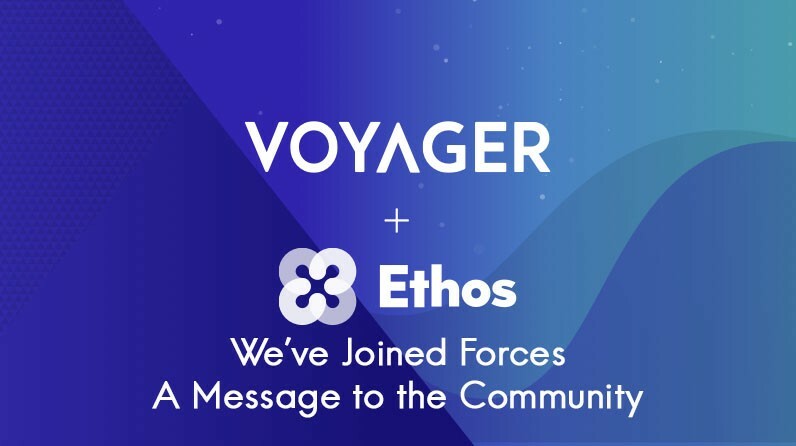 Ethos and Voyager will be rolled up under a single entity, but users of both products will see the effects of this roll-up over a longer period of time. Both sides intend to maintain both brands and products, but integrate the systems quite closely to build a better service for users and additional utility for the token. Together, we will be a stronger organization with a clear vision, robust product and larger reach. We see Voyager’s smart order routing technology to be the future of crypto trading technology. The same shift happened early on in the equities world with the emergence of online brokers and services that connected to multiple liquidity venues to improve the prices that customers got on their trades. Voyager is greatly enhanced by an organization with deep crypto experience and technology that can help make its vision a reality. Ethos had focused on building Bedrock — a scalable blockchain technology platform that could service a wide variety of crypto related services. The first consumer of this technology platform was ourselves through the Universal Wallet, but we see a future that includes far more applications than that. With a rapidly changing regulatory landscape, the intelligent application of this technology within the right organization is crucial and we saw that Bedrock would solve some of the complex regulatory, financial, and technical challenges for Voyager. Voyager was facing complex regulatory, financial and technical needs which Bedrock would fulfill. This deal is not a simple acquisition and has taken some time. Ethos is fundamentally evolving the positioning of Voyager, and the joint organization will be challenging status quos that have plagued both the traditional and crypto industries. Voyager brings the traditional financial and disruptive technology expertise to change the system from within and Ethos brings the crypto philosophy and technical know-how to impose that change onto the world. The acquisition numbers circulating do not represent the full scope of the deal, as there was an exchange of Voyager shares in return for certain IP and an overall value exchange between the two organizations. This was not a deal in which a check was made out to Ethos in exchange for our company. Instead, this deal is comprised of a value-exchange between two organizations are incentivized to accomplish more together than each on their own. Both companies in this deal are motivated to build value for one another, as both the stock and tokens are subject to lockup and vesting. The terms of the deal require us to build value for one another to be fully realized. Our community was our priority through this process and will reap the benefits in the form of an accelerated product roadmap, fiat gateway and token utility implementation. The organizations are joining forces to grow users, increase trading volume and expand token utility and liquidity together. Through the public equity structure that Voyager has set up, everyone is given equal opportunity and exposure to all aspects of both businesses and trust is built with users knowing that the company has to meet a high standard for all business operations. This merger benefits the Ethos community and the people who have been loyal and supported Ethos from Day 1, as well as those who have joined the journey along the way. Through this ETHOS is becoming a token that powers the next generation crypto broker. Voyager has already committed to utility in the form of cashback on trades based on token holdings, but we see additional utility opportunities in margin trading, collateral, withdrawal limits and payments. Token utility will become a key priority for the joint organization. For avoidance of doubt, stipulations of the contract terms make token utility a focus of the joint effort development pipeline. I will be joining the Voyager board of directors and management team as Chief Innovation Officer, responsible for setting the technical and philosophical compass of the organization. Ethos and Voyager have the opportunity to disrupt the status quo not just for crypto users, but for financial services through the transformative power of crypto. We believe that crypto technology was meant for all of us and we are building a future that is for everyone. A sincere thank you to the community for continuing with us through our journey and we are excited to share the next chapter with all of you. We will be sharing more details as there is quite a bit to unpack here so expect to hear more from both of us at Voyager and Ethos over the next few days!